The Ghosts in Our Machine is one of my all time favorite documentaries about cruel nonhuman animal consumption for profit industries around the world. 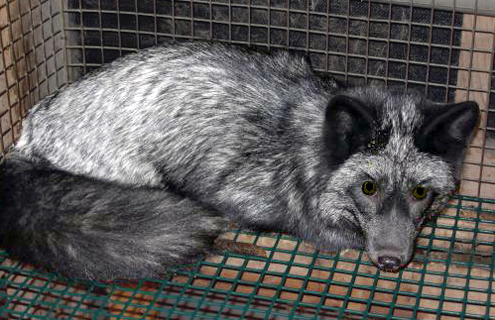 In one of the opening scenes of the movie, Jo-Anne McArthur, photojournalist extraordinaire, is seen driving to a fur farm in Sweden in the early hours of the morning in order enter the buildings and take pictures of the enslaved, mistreated, ill and frightened foxes who are being exploited for their fur. the foxes are in critical condition and suffer from serious health problems, including dehydration, emaciation, toe and tooth fractures, tail injuries, ear and eye infections, internal bleeding and neurological issues. If memory serves, the CBC was interviewing someone from the Fur Council of Canada who said that this is an isolated incidence of mistreatment. 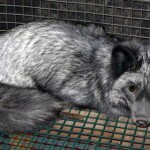 He said that farmers who own and “raise” foxes and minks for the express purpose of selling their fur have an obvious interest in maintaining the “integrity of the pelts” (his words, not mine). So, even though there are no governmental regulations in place to protect these beings, the farmers self regulate in order to protect their investment. He briefly mentioned the ethical issue of treating beings in this manner, but only in terms of ‘raising ‘ them not in terms of holding them hostage and ultimately killing them. There was a huge outcry by nonhuman animal rights groups, including the SPCA, who first investigated this farm in May of 2014. There was a province wide appeal to the Quebec Government to rescue these very mistreated and ill beings. The government’s stance is that they are monitoring the situation and want to give the farmer(s) a chance to improve the conditions. …..when mink are released like this, irresponsibly, most of the mink are killed. …many of the animals would likely be hit by cars because they’re attracted to the sound of engines, which they mistake for the feeding mechanism back at the farm. 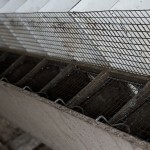 ..the mink are aggressive, and it is possible the released animals will attack other smaller animals. These two incidents come on the heels of an August 9th, 2014 announcement by the new Quebec Minister of Agriculture, Pierre Paradis concerning the legal, moral status of nonhumans. We’re looking into the judicial consequences of that but we don’t want it (the animal) to remain personal property. We’re right in the middle of a free-trade deal with Europe and we will be affected if we do not adjust. We’re seeing how things are evolving in Europe on agricultural farms — there are larger cages for pigs and more space for chickens. If you’re not part of this movement, you’re going to be excluded. We were inspired by what was done in France, where they redefined the concept of the animal as a being that is capable of feeling pain. Gandhi said the evolution of a society can be judged in the way it treats its animals. There’s room for evolution here. 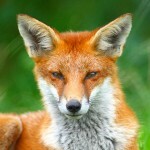 Adopting a wait and see attitude after they were provided evidence of gross mistreatment and abuse of the foxes is neither cool, not acceptable. The farmer obviously does not have the best interests of these beings at heart. I find it impossible to believe that this is an isolated incidence of abuse in the farmed for profit fur industry. The documentation and photos provided by undercover investigations are far too damning. M. Paradis mostly talks about how nonhumans as persons in the Civil Code will benefit Quebec, its economy and its reputation worldwide. He refers to these “soon to be persons” as it. We need to free nonhumans, not give them bigger cages. I am on the fence about this. It is my inclination to support efforts to come to the immediate aid of those suffering. I sometimes wonder if the act itself is what the media and naysayers pounce on in order to discredit nonhuman animal advocates. We are labelled as radical and acting outside the law and therefore, not credible and certainly not mainstream. I don’t think all animal rights activists should be seen as militant, violent or as “terrorists”. Of course, there is a fraction that is seen in this light. Historically, I think the animal rights activists have shown the world the cruel and deplorable conditions for factory farmed animals and a lot lot more. By exposing what is going on in the fur industry, you’re not necessarily supporting the animal rights activists’ actions. Most of those mink won’t survive but for some of them, instinct will kick in and they will surely be better off than where they were. Even ducks (and geese) who were gavaged and had never seen water, very quickly figured out what to do when they were released. Atrocities like this are ongoing in so many parts of the world. The focus continues to be on the human element and what is good for us. If we work only to improve the lives of these beings, they will never be free. Industries, like the fur industry, supply a completely non essential fashion product to those with enough money to pay. The fur industry is not, as the Fur Council of Canada says on its website, A Canadian Heritage Industry in Harmony with Nature. It is an industry perpetuated by cruelty and fueled by greed. It needs to end. I agree that the treatment received by an animal in captivity is left to entire discretion of the “farmer”. If there is no regulation that establishes a minimum, nothing will prevent what is happening now. it is not he UPA or other farmers’ association that will force its members to increase their cost of veterinary, bigger cages, better food, heating etc. The government has to do something and it usually waits to see how many voters are asking for the changes. The more voters complaining, the quicker the government will act. Now the government is saying that it wishes to change the Civil code in this respect. How long will it take is unpredictable. In the meantime, “status quo” ! I understand what you are saying about how the farmers may see things and how the government may react. However, we are talking about the lives of sentient beings who have interests, feelings and lives of their own. This is an extremely urgent issue . I don’t think it should be about better treatment or bigger cages. and yes, I agree with you. It is too bad!!!! We all need to put in our two cents, if things have a chance of changing. So, thanks for that. Apparently fur is again becoming more popular in the world of design. I read an article about a vegan designer who will not use it. Can’t think of his name at the moment. It’s all about the money, money, money! As a vegan and someone who has watched “Earthlings”, one of the scenes that sticks in my mind the most were those of foxes and mink that were trapped in small cages displaying “stereotypical behaviours” as they like to call it. They were literally skinned alive and these images will forever haunt my mind for as long as I live. I do not even wear “faux-fur” anymore because I heard even this can come from cats and other creatures. I also don’t wear it for the same reason I don’t like to eat “fake meat”. To me it is still promoting “a look” and I think we need to get away from that. I feel sick just remembering this! I love foxes so much. Their coats are not ours to steal and to think that people still wear it in this day and age is beyond my comprehension. Yes, the fur industry, as all industries which use and exploit other animal species for our wants, not needs are despicable in thought and in deed. I did not watch Earthlings and am not sure if and when I will be able emotionally to do so. I stay away from faux fur as well for the very reasons you mention. And yes, there is plenty of information out there about why killing other species for their fur is totally unnecessary and completely gratuitous on the part of humans. With winter on its way, I dread the thought of fur line hoods on parkas, fur pom poms on the top of children’s toques and fur coats adorning the bodies of humans who could know better. It is my most fervent wish that this ends now, today!